Israeli soldiers attacked, Tuesday, the car of the Jihad Nawaj’a, the head of Susiya Village Council, near Yatta town, south of the southern West Bank city of Hebron, as he was driving near an Israeli military base. Rateb Jabour, the coordinator of the National and Popular Committee in southern Hebron, said the soldiers attacked Nawaj’a’s car near the military base, which was built on Palestinian lands in Susya, and smashed some of its windows. He added that the soldiers also obstructed Palestinian traffic in the area, while illegal colonist settlers attempted to attack the Palestinians. 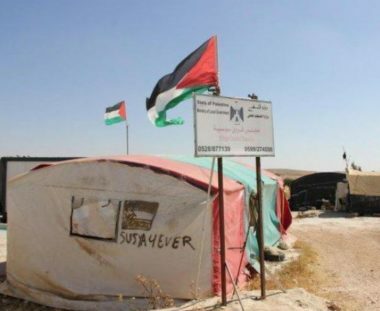 It is worth mentioning that Susya village is one of many Palestinian communities, south of Hebron, and is subject to constant assaults and violation by the soldiers and the illegal colonialist settlers, especially since Israel intends to demolish it. In 1948, some of the native inhabitants of the village were displaced from the area which became known as the ceasefire line, or the Green Line, separating the newly formed state of Israel in the historic land of Palestine from the West Bank, and isolating the village from Be’er as-Sabe’ (Beersheba). The displaced Palestinians moved in with their relatives in Khirbet Susya village, and in 1982, Israel confiscated more Palestinian lands and built an illegal Jewish-only colony, carrying the same name of the village. In 1986, the Palestinians were displaced again when Israel confiscated more Palestinian lands to annex them to so-called “Israeli Nature and Parks Authority,” after Israel declared the area as an “archeological site,” and they started living in Khirbet Susya, surrounded by the illegal Susya Israeli colony from the north, and the “national gardens” from the south. Since then, the Palestinians have been trying to get Israel to approve the structural plan of their village, but to no avail, especially since the village is in what is known as Area C of the occupied West Bank, under full Israeli control. Similar to hundreds of Bedouin communities in the Negev, the village remains unrecognized by Israel.